In a place with more photo ops than residents, locals know that Hawaii’s scenic landscape never stays the same. The latest example of change comes from the Big Island’s western edge, where flowing lava has given way to a newly formed black sand beach that’s become a stomping ground for wave-chasing community members and visitors. Last May, the Kilauea volcano spewed lava across Hawaii’s largest island, devouring cars, trees, and houses whole, and causing an estimated $480 million loss in tourism money. 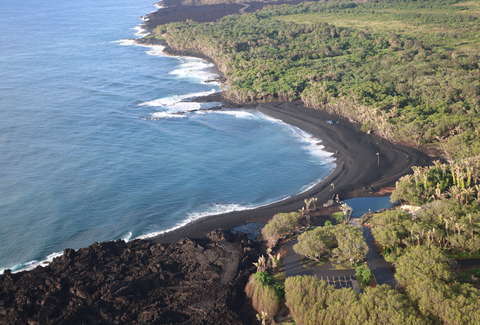 But amid the destruction, science worked its magic and created a new crescent-shaped black sand shoreline with two surf breaks and a few thermal ponds. Tina Neal, scientist in charge at the USGS Hawaiian Volcano Observatory, explained to the Los Angeles Times that cold ocean waves help break hot lava down into smaller pieces. “All of that produces a source of sand, and that sand is carried by the ocean current down the coastline to the places where it will naturally accumulate,” she said. When molten lava rolled into the sea at Isaac Hale Beach Park last spring, black sand was formed and dispersed along the shore. The resulting otherworldly landscape isn’t the first of its kind, but it is the largest black sand beach that’s emerged in Hawaii in recent history. The shore is now open to the public from 9am-6pm every day, so people can see what’s been called a “silver lining” in the aftermath of Kilauea. The sand is still a bit rocky, there’s no drinking water due to damaged water lines, and Hawaii’s Department of Parks and Recreation warns of dangerous currents in the water, but that hasn’t stopped eager surfers and swimmers from checking it out for themselves. Luckily, there’s a lifeguard on duty for that reason. Kyler Alvord is an editorial assistant for Thrillist Travel. Follow him @ksalvord.